In June 2008 we had the chance to relaunch another tent building for 2 clients in Hungary and Austria. Herbert Pfeifer and Kristina Ambrosch visited the families during the tent construction in order to see old friends again and to maintain the good economic connections between the families and the Black Tent Research. Like last year, family Simsek and family Surgun built the new tents under the mentorship of Mehmet Simsek. The young ones took a day off from their work in order to watch the big spectacle of tent building. 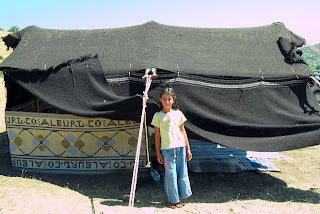 And this is one of the new tents and the cute daughter of Surgun family. 09th July 2007 - The old master of black tents cannot build us a new tent due to family troubles. He has to take care for his people as first priority and we hope that all turns out well for him and his family. 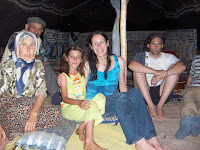 Thus, the Simsek family helps us out and organizes all Yoruk families in the surroundings to build us a new tent. We are also part of the building process. Nonetheless, we are able to document perfectly. This amazing combination was the idea of the genius father of Simsek Family. 10th July 2007 - The tent is finished after 1,5 days of intensive work. 8-10 people were working hard on it. Men and women did whatever had to be done. There was no definite working order or division. Still the group cooperated perfectly. This beats all the sayings! Our Thanks are endless. 12th July 2007 - Father Simsek plans to build our second tent on 23th July. 15th July 2007 - Tire: A city close to Selcuk, well known for its handicrafts and delicious Koefte-meal. We filmed the production of traditional felt-floor-covers for the nomads. 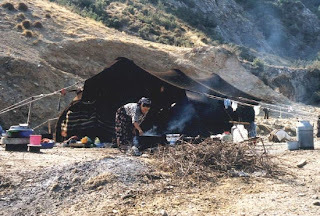 17th July 2007 - Besides the numberous invitations of the nomads at the goat-castle, we also accepted the nice invitation of family Cetinkaya to sleep a night in their tent. They showed us, how to shear goats. 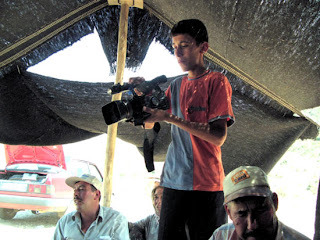 19th July 2007 - Today we got the chance to film the secret villages of the black tent weavers. There, one of the last vertical black tent looms is still in action. Meanwhile, we also became subject of internal economic fights between the villages. Due to diplomatic tactics, we could calm down the situation. 23th July 2007 - The second tent project starts. Again, we drive to the secret villages of black tent weavers in order to buy the necessary textile. Father Simsek helps us get the rare allowance to film the industrial production of the textile. He himself is surprised about the dimension of the production: the village supplies Saudi Arabia, Africa, Europe, ... with this rare textile! Each year 3000 tons of wool. 24th July 2007 - By high speed the second tent gets built. The team gets more professional. In addition the tent also becomes more colourful and artistic than the first. Even Grandfather Simsek helps sewing the tent. He is a magnificent old man who taught himself how to read. His grandson told us that grandfather loves history books. Today in the evening we found some books as a present for him. The tent was finished with a big festval of beer and grilled chicken. 26th July 2007 - Our project comes to its end. 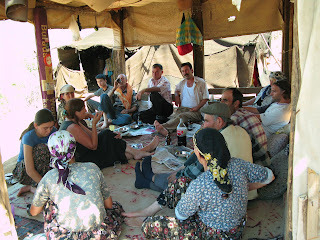 In our last remaining days in Turkey we visit again all 4 nomad families in order to say "Good Bye". Meanwhile, the heat of July reaches its climax by 45 degrees Celsius. We are living in a hot steaming oven! 27th July 2007 - We say farewell and give presents to each other. And we are looking forward to a merry meet in the year 2008! Father Simsek tells us, that the tent-making was fun and that they love to create more tents for us. With sad and happy eyes we start our journey alltogether with our 2 tents, 2 olive trees and many things and memories. 29th July 2007 - We are back in Austria. It is cold! There is rain and wind. Is winter coming already? 1st August 2007 - Slowly slowly we recover from the journey. As we got used to extreme heat and extreme endurance, our body now claims its rest. Meanwhile the next crazy plan develops: Next year we will import the most wicked herd animal from Turkey to Austria: 4 black long-goated goats. As for the filmproject: our material is really great. Now we have to work on 30 hours of documentation and shorten it down to a classical documentary film of 1,5 hours. This will take a year of work. You will see the result, then :-) !! You might have noticed that I did not update the old site for several months. This is due to my decision that I will build the site anew completely. And viola: Here ist is. The new Black Tent Website. I hope you enjoy it. Unfortunately it is not translated into German yet, but this is one of the things to come.